October 22, 2016 was definitely a day to remember. Alumni, students, family and friends gathered on and around the Harper Davis football field to celebrate a major event: homecoming. 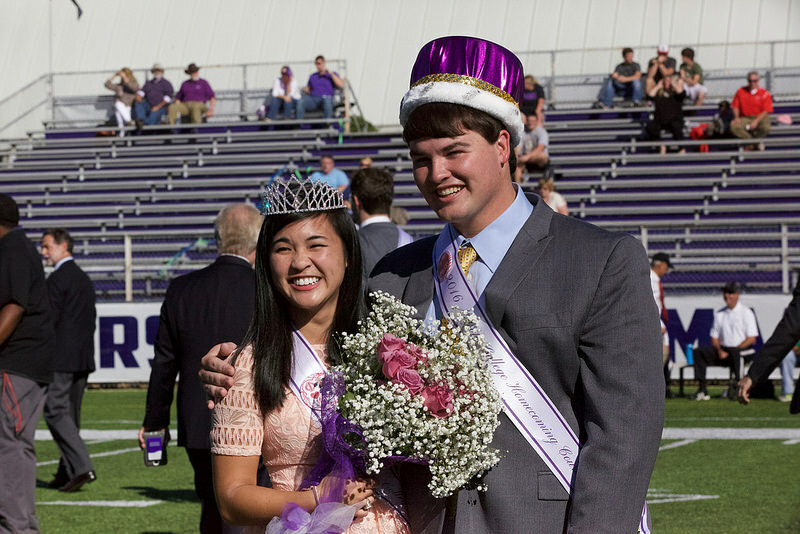 The day was especially special for Cherilyn Cabanero and Sean Connelly, as the student body chose them for homecoming king and queen. Although Cabanero expressed appreciation about being chosen as homecoming queen, her favorite part of homecoming came earlier in the week. “The first day of homecoming, they had the movie night in the bowl. Suicide Squad is one of my favorite movies. We combined that event with a Senior Year Experience event. We had a senior VIP area. It was pretty exclusive,” Cabanero said. Cabanero is very active on campus. She is a member of the Phi Mu sorority, Omicron Delta Kappa leadership honorary, Tri Beta honorary, Sigma Lambda honorary, Alpha Epsilon Delta pre-health honorary, SYE and Student Affiliates of the American Chemistry Society. Additionally, she serves as a member of the Student Body Association. Cabanero is also a writing center consultant, Foundations leader and member of the women’s lacrosse team. Connelly, a political science and economics double major, was happy to see his friend Cabanero crowned as queen. “Me and Cherilyn are pretty good friends, so hearing her name after mine made me pretty happy…knowing how deserving she is. So that was definitely my favorite part of the week,” Connelly said. Connelly is also involved on campus in numerous ways. He serves as the president of Order of Omega and Politics and Government Club and is the Vice-President of Inter-Fraternity Council. He is a Foundations director and a member of the Kappa Alpha Order fraternity. Connelly also plays for the Majors baseball team.